Hope's Cafe: SGSG-Alo Spotswear Review and Giveaway!! Here's a great gift idea-some new sportswear! And if you're looking for top quality sportswear at reasonable prices, I recommend you check out Alosport.com! Alo stands for Air, Land, Ocean, and they have athletic apparel for men and women. I was sent a couple items to review from Alo-the Women's Short Sleeve Bamboo Tee and the Men's Short Sleeve Performance Tee. The shirts came packaged in a nifty box that would work great as a gift box. I immediately fell in love with the bamboo tee. It is so soft! Very comfortable, and it has become my favorite shirt to wear while exercising! Whether doing an aerobic program, biking, walking, or strength training...this is the perfect shirt to do it in! It isn't baggy, so it doesn't get in the way while exercising, but at the same time, it's not too clingy either. I can't stand clingy clothes (especially during workout), and this is just right. The shirt has contrasting thread at cuffs and bottom hem, giving it a little extra style. The bamboo offers moisture wicking as well. I gave the Men's Performance Tee to my brother, who in addition to working out every day, also enjoys playing basketball. He wears this shirt a lot, and said it is very comfortable! 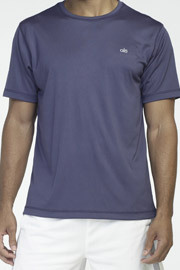 This shirt is 100% polyester knit, and features CoolFit dry wicking capability to draw moisture away. Based on the response from my brother to this shirt, I would say Alo sportswear would make a great gift for men, too! "Our young, energetic team has created a collection of performance clothing named for the elements that we live within: Air, Land and Ocean. Each carefully designed piece was created to perform with you while promoting a life of style and well-being. Through the use of recycled and minimal impact materials, alo creates high performance activewear that delivers superb function, fit and style. With environmentally mindful design and production processes, our men's and women's collections utilize eco-friendly performance fabrics that provide outstanding comfort and results. Our most technically advanced Bamboo Jersey fabric has inherent properties that wick moisture and is naturally anti-bacterial, hypoallergenic and breathable with no added chemicals." Check out this Youtube video about Alo's fall/holiday line! Alo is giving a Women's Short Sleeve Bamboo Tee to one of my readers!! Become a fan of Alo on Facebook. Leave me a comment. 1 entry-Follow Alo on Twitter. Leave me a comment. 1 entry-Go to Alosport.com and tell me your favorite item! 1 entry-Visit Alo's Blog, and leave a comment on one of their posts. This giveaway ends Tuesday, November 2, 2010 at 11:59 p.m. Please leave a valid email address in each comment, as this is how the winner will be notified. Winner will have 48 hours to respond, or another winner will be chosen. Giveaway open to US residents only. Disclaimer:I was not monetarily compensated in any way for this review. I did receive product for the purpose of review. All thoughts and opinions are mine. All quotes taken from the Alo Sport website. I follow Alo on Twitter. I really like the Origami Asymmetrical Tank. Really cute. I became a fan of ALO on FB. Please enter me. Thanks! I entered the Wall Decal giveaway. Entered the Education games giveaway. Entered the Bonita J. giveaway. I follow several giveaway blogs including this one and notice that Charity enters most of your giveaways. Why is Charity entering this giveaway when I saw that she hosted her own Alo giveaway not too long ago? I strongly doubt that companies would give free product to bloggers like yourself if they knew you were just entering each other's contests and not giving anyone new a chance to win. It's a bit shady. I hope these companies wisen up soon. I like Alo on facebook. I love the solid stitch pants!